What steps are you taking to improve the experience for beginners playing the cloud version? Nakamura: We’ve had opinions from people who are not sure how to earn experience and [Meseta] so this time we added an ‘arcs handbook’ with tips about things that are good to know when first starting out. We’ve also some content called [Arc Lord] with introductory mechanics so if you follow the game path you should be able to progress without getting stuck. Since we’ve been up and running for close to six years, the amount of content has increased enormously and to be honest that made some aspects complicated. While we’ve done a lot of additional content up until this point, we hadn’t done much reduction of content, so in order to reduce the complexity we’ve put a lot of eﬀort into reducing and adjusting several areas as well. So the eﬀect stacked and had the opposite eﬀect (laughs). Nakamura: So then we increased the strength of the enemies a bit to counteract that as well. Sakai: There is a lot of content so we haven’t really made much content specifically for the Nintendo Switch but by organizing and adjusting the content we’ve made the experience more enjoyable. The story is substantial so it’s hard to believe that you’ve reduced the content. Sakai: It’s been six years so… There really is a hefty amount of content, I think. There’s also no need to play everything at once. It’s OK to just play an hour or two when you feel like it. When you feel like you’ve gotten a bit bored you can also start from the beginning… There are also time limited ’emergency requests’ where the most people gather, so many players only play during those times. Sakai: There are multiple ways to enjoy Phantasy Star Online 2, I think. Playing at the casino, resting at a cafe, creating a gathering and so on. Trying lots of things and then finding what you enjoy the most is part of the fun. Nakamura: If you’re in doubt, asking other people and communicating is one of the pleasures of an online game I think. We’ve made it easy for beginners to gather in certain places so they can have lively discussions with each other. During that process, people become friends and make teams and the game gets even more fun so definitely try communicating with others! People that have experience as well should try making friends with lower level beginner players and helping them out. You can make several characters for free so use that as an excuse to try a diﬀerent class or gender and make a new character. It’s easy to take photos with the Capture feature as well, isn’t it? Sakai: Phantasy Star Online 2 has been OK with players uploading photos to social media from the very beginning so we’d like people to take lots of photos and share them. Nakamura: There are many players putting lots of eﬀort into taking screenshots. One of the big selling points of Phantasy Star Online 2 is making the ‘ultimate’ character and there are so many parts to choose from, from pupils to eyelashes to clothes… Many players spend a huge amount of time in creating their ideal character. Sakai: If you go by abundance in variation, I think we’re the world leader. Nakamura: You can make characters that are so diﬀerent that you sometimes wonder if they’re from the same game so many players make strange characters and others try to make their ideal ‘cutie’. Sakai: Once you get hooked on taking pictures you discover just how deep the feature is. (laughs) Probably more than in any other game, you can really grow attached to your character. Nakamura: If you use a voice ticket you can also change the voice of your character to make it sound like that of your favorite actress and… That’s fun too! 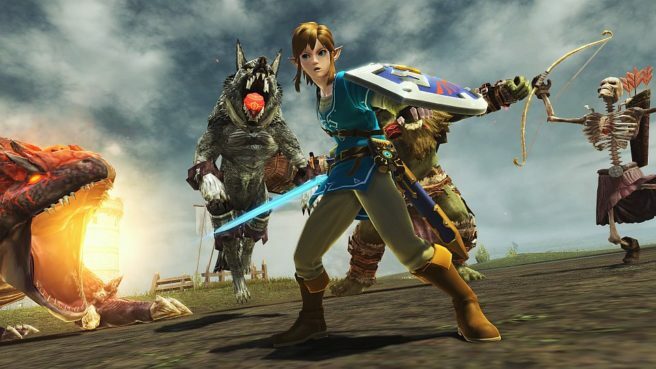 What was the reason for the Nintendo Switch exclusive collaboration with The Legend of Zelda: Breath of the Wild that includes Link’s costume and weapons? Sakai: Collaborations in Phantasy Star Online 2 have always been popular and since we were working with Nintendo hardware we wanted to do something special. The latest episode features the middle ages as the main environment and Breath of the Wild is a representative title for the Nintendo Switch so we thought that if we featured Breath of the Wild then all Nintendo Switch users would have motivation to give Phantasy Star Online 2 a go as well, so that’s what we suggested to Nintendo. Sounds like a surprisingly smooth collaboration. Sakai: Nintendo has a lot of popular titles but since we have to pick one it had to be The Legend of Zelda. How was the reaction within the development team to the Zelda collaboration? Is that because some members of the development team were already playing Breath of the Wild? Sakai: Yes. Many of our staﬀ are playing Breath of the Wild. I was surprised at the resemblance to between the character that was shown in the Nintendo Direct and the real Link! Nakamura: Thanks to that, things with Nintendo went smoothly. It’s been a long time since you’ve been on Nintendo hardware, so many users might not have played Phantasy Star Online since the GameCube. Nakamura: Many of the clothes and weapons that were available during the Phantasy Star Online era are also in Phantasy Star Online 2 so there’ll be lots of “Wow! This is so nostalgic!” moments, I think. “I want the rare item that I spent ages searching for before” and those kind of feelings might become good motivation. When you find a nostalgic item it really makes you want to collect them all, doesn’t it? Nakamura: Even items from collaborations with third-parties might be a bit nostalgic. Sakai: On the topic of collaborations… At the end of April we have a collaboration with RE: Zero and later on we are planning a collaboration with Don Quixote so Don Quixote stores will appear in the Tokyo Field. Sakai: Yes. It’ll be the first ‘real world’ collaboration to appear since we launched Phantasy Star Online 2 Cloud. In the real Don Quixote stores you can find collaboration items, some of which come with item codes. Nakamura: A collaboration that goes beyond the game world and the real world. Sakai: Phantasy Star Online 2 is a game that can achieve that. Either way, I don’t think there are any other games where you can play this much for free so for those people that have yet to try it, definitely give it a go. The easiest way to start is the Nintendo Switch Phantasy Star Online 2 Cloud version, I think. Nakamura: If you feel like giving it a quick try… It only takes a moment to download so we would be happy if you tried it.